(Bloomberg) -- A ship carrying U.S. soybeans took off for China last week just before the Asian country’s retaliatory tariffs went into effect. The shipment of about 69,000 metric tons was loaded from the Pacific region in the week ended July 5, the U.S. Department of Agriculture said in a weekly report Monday. The following day, China imposed tariffs on a slew of American agricultural goods. The country’s ministry of commerce has told companies to boost imports of goods including soybeans from countries other than the U.S. The cargo was loaded on a vessel named the Star Jennifer, according to a USDA website. 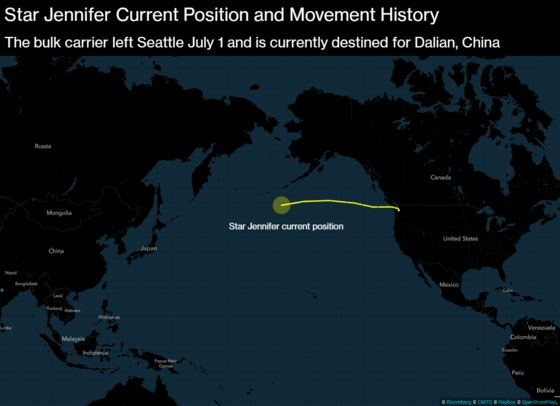 That ship departed from Seattle early this month and remains destined for China’s Dalian port, according to vessel tracking data compiled by Bloomberg. The USDA didn’t immediately reply to an email seeking comment on the shipment. China will reimburse the buyer for the cost of the 25 percent tariff on soybean imports from the U.S. if the cargoes are for state reserves, Bloomberg reported earlier citing people familiar with the matter. At least one U.S. soybean cargo currently on the water is destined for state reserves, according to the people.